I hope you are all doing well, and enjoying your weekend. Have anything exciting planned? I am gearing up for a busy few weeks that I have ahead of me. I have to study this weekend for a math exam, and prepare a presentation for my business class that will take place in a few weeks. I have been super tired lately. When I get home all I want to do is sleep. LOL! The only thing that puts me at ease is the fact that the semester will be over soon-in a month to be exact, and I will be graduating soon. I am almost to the finish line, and to be quite honest, I am a bit scared...But that's another story. Anyways, I want to share with you all a few beauty products that have been in heavy rotation lately. Let's get to it! 1. Benefit Hoola Bronzing Powder- I have been using this bronzer from Benefit everyday for contouring. I also use it for adding a healthy boost of color to my complexion. The weather is cooling down here in NYC and I am paler than usual, so a bronzer is a must in order to add a bit of 'life' to my face. Click HERE for my review and swatches. 2. MAC Mineralize Skinfinish in Soft And Gentle- If you are looking for a highlighter that will add a natural looking, healthy glow to your face, look no further. I like to apply a bit of this highlighter along the bridge of my nose, and on the highest points of my cheek bones. It gives my a lit from withing glow. Click HERE for my review and swatches. 3. Maybelline Instant Age Rewind Eraser Concealer in Neutralizer- I plan on doing a full review of this product very soon, but so far I am really liking this product. I apply this yellow-based neutralizer on my dark, under eye circles and then follow up with my concealer of choice. The neutralizer helps minimize the darkness under the eye area, and allows the concealer to cover more effectively. 4. MAC Select Cover-Up Concealer in NW25- This was my first ever MAC concealer...memories. I don't know why I have left it unused for so long. As you can see, I am almost running low on this concealer, and I just may purchase it again. The shade, NW25, does quite a nice job when it comes to covering my dark, under eye circles. Its easy to blend as well. A little bit of product goes a long way. 5. E.L.F. Mineral Infused Mascara- When it comes to adding length, this mascara does not disappoint. That's all I will say for now because, I will be writing a review of this product, as well as show some before and after pictures, very soon. So, make sure to be on the lookout for it! What products are you all loving, lately? 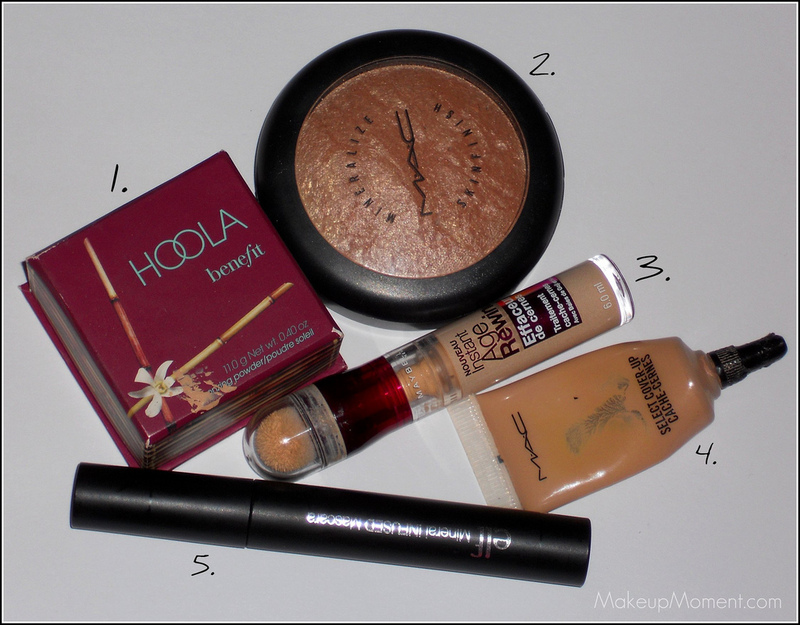 Great favourites hun, especially Benefit Hoola which is my favourite product for contouring too! It just looks so natural!